Sketch female portrait in perspective. Here is a drawing video and step by step tutorial on how to sketch portrait in slightly top view perspective. This one I also draw a diagram direction of how I actually think when I start observing my subject before I draw. 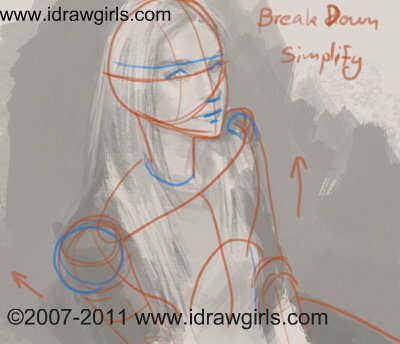 If you take a look at the drawing break down, I usually simplify what I see into simple shape. Then I start drawing those shape first to measure, layout and get correct proportion and likeness. And since this one is in perspective, the arrow indicate that they are coming from a vanishing point somewhere off the drawing. If I would draw a line from the arrows down out of the frame they would intersect somewhere below. Where the intersection happens is the vanishing point. This would actually apply to all the drawing, perspective is really important key to get your drawing looks correct, especially in environmental and industrial design. It doesn’t play a lot of roll in figures or portraits drawing because we, artists, usually eye-ball organic shapes instead of trying to craft it out mathematically. I have two questions to ask you if it’s not to much trouble. 1. What is your opinion on using the freeware Program Gimp over Adobe PhotoShop considering I have a constraining budget at the moment. 2. I am currently having a hard time figuring out were to go from here. You see I am proficient at drawing a near exact recreation of most art I see, the problem though is that when I try creating original art I can never seem to realize the images I see in my mind. These two points have me quite frustrated at the moment so any advice would be extremely helpful. 1) There is no need for PS, just pencil and paper…make them GREAT and Exceptional in drawing skill. Program are just tool like pencil, people can judge you by your traditional skill of how good you are. 2) I know people like that. The catch is, you have to practice…look for all kind of inspiration from online, offline, forum, etc. Get some idea together…or you can start with some easy shape and form of cartooning…then go from there. Also practice life drawing, drawing from real life with the limited time frame…it will practice your brain to have a natural flow and be more efficient and economy in using line, shape and form. Practice make perfect,…when you try something new out of your comfort zone, the first few or more might not be good, but keep doing it….you will see the big step up from where you start. Keep going and don’t be discourage. 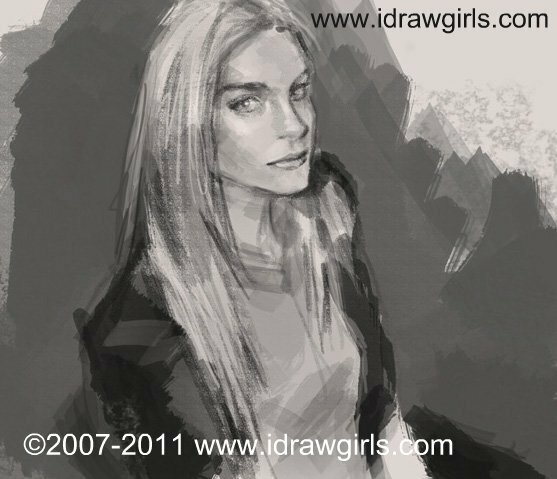 Watch the video how to draw woman face and body in perspective. Below are diagram instruction so you would understand a slight perspective direction and vanishing point.